Yes there is a wedding show in Peterborough in 2011. And it’s coming up January 23rd 2011 from 11am – 4pm. Tickets are only $10 for over 100 exhibitors, door prizes and more! 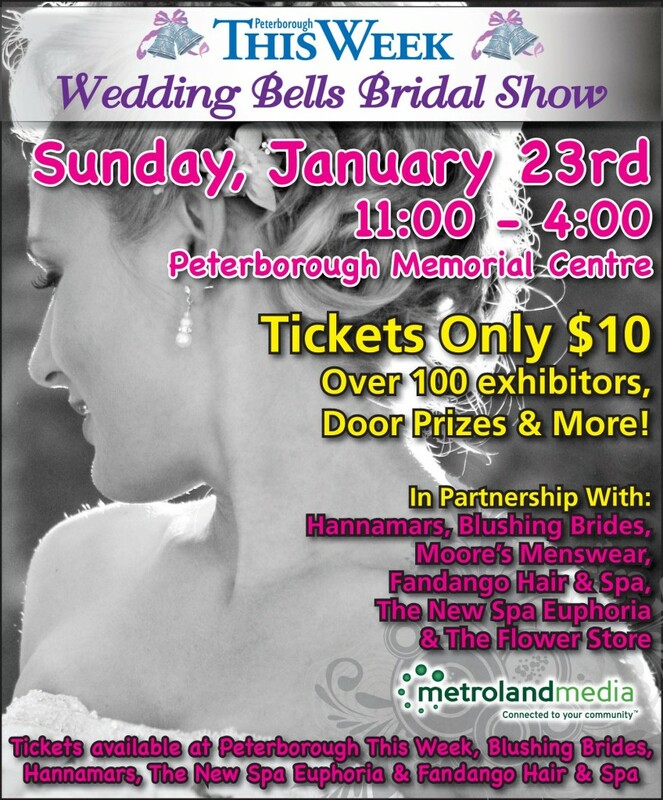 Get your tickets today by visiting Peterborough This Week, Blushing Brides, Hannamars, The New Spa Euphoria, and Fandago Hair & Spa. Stay tuned also for the February Kawartha Spring Bridal Show at The Venue! Good Morning: I am contactng you today because I am a local event planner, just south of Lindsay, in the City of Kawartha Lakes. I have been looking at volunteer opportunities in the area, now that my children are in their teens and I would like to volunteer my time to assist with any upcoming Bridal Shows. Although I have no experience in Wedding Planning, I have a wide vareity of skills and knowledge in pulling together many other different types of events that may be of help. If i can be of any assistance, please contact me by calling 705-879-2689 or via my email address. Hi! I’m looking for a list of vendors that were at theWedding Bell show, specifically one lady who made fabulous cupcakes. I unfortunately lost her contact info. Is there anyway to get a list of people who where at the show? Hope this helps you Helen!